Julen Lopetegui dismissed questions about Thibaut Courtois' footwork after Real Madrid beat Espanyol 1-0 to move top of LaLiga. Courtois was recalled in goal for Saturday's match at the Santiago Bernabeu after Keylor Navas was preferred for Madrid's midweek Champions League defeat of Roma. The Belgium international, winner of the Golden Glove at the World Cup, collected a clean sheet without being seriously tested despite Borja Iglesias' chip hitting the crossbar. 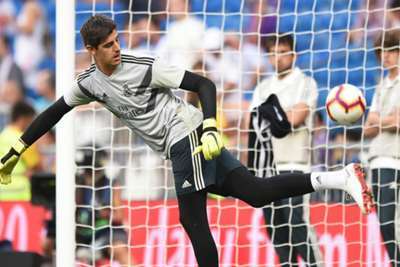 And asked about Courtois' ability on the ball after Madrid's narrow win, Lopetegui suggested it is a matter of practice for the former Chelsea goalkeeper. "He has conditions to be able to do it, he does it and surely he will improve more," Lopetegui told a news conference. "I would not dwell on a problem that does not exist. He has a good command of the ball, a good kick. "When a start does not work out sometimes it's not the goalkeeper's fault." Raphael Varane stressed in a post-match interview that Madrid cannot expect to win 5-0 every week and Lopetegui accepted his team had to battle for the points having easily beaten Roma last time out. "They are two different competitions. The league has complex matches and this was one of them," Lopetegui added. "It's what the league has. We knew it. "The most positive thing is that the team has taken the three points, has known how to suffer, you also have to do it to win a league. The main reading is that we have known how to suffer because we also have not been able to close it. "Espanyol closed us down, but also knew how to attack. But what has hurt us the most is losing control. The team have made a great effort and has achieved three very important points." Teenager Vinicius Junior was named in Madrid's initial squad for the Espanyol game but the Brazilian did not make the cut for the final 18. "We put him in because 48 hours ago there were people who could not train and we made decisions," Lopetegui said. "He is not in the squad because [Federico] Valverde is in the squad. Nothing else."